If you are looking for a great child minder in Glengarriff – look no further! Catherina Downey is a registered childminder with over twelve years experience, qualified in first aid and c.r, garda checked, with excellent references. 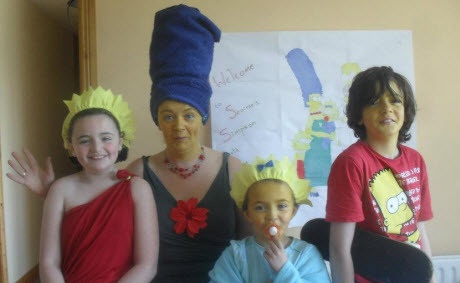 Childcare Glengarriff - the Simpsons! Very flexible childcare available full time or part time. “Trina loves kids and they love her right back. She has kept my two children many times for periods from a few hours to a full week staying overnight. “Trina is brilliant! She has both our children at the moment and they are always happy there. Trina goes the extra mile (and then some!) to keep everyone occupied, invent activities, go for walks and outings. I can personally vouch for Trina – Lucy loves going and a fantastic happy girl comes tripping home with paintings, baking and wonderful things they have made!